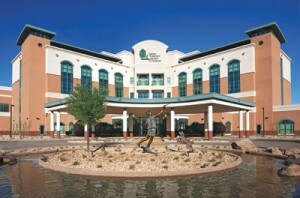 Cancer Treatment Centers of America headquarters. Centers do not reach everyone. In a recent study published in the journal, Cancer, researchers from Dartmouth found that, for African Americans, where you get treated for cancer affects your survival. Onega and her colleagues found that place of service may partially explain the higher mortality experienced by African-American Medicare beneficiaries with cancer compared to their white counterparts. Onega et al analyzed 201,305 Medicare patients with a breast, lung, colorectal, or prostate cancer diagnosis between 1998 and 2002. They found that while African Americans had a higher likelihood of all-cause and cancer-specific mortality both 1 year and 3 years after diagnosis than whites (cancer-specific: 1-year odds ratio [OR], 1.13; 3-year OR, 1.23), excess mortality was no longer observed for African-American patients who attended National Cancer Institute (NCI)-designated comprehensive or clinical cancer centers (cancer-specific mortality: 1-year OR, 0.95; 3-year OR, 1.00). In addition, when the models were stratified by racial category, the researchers observed a decrease in the likelihood of 1-year and 3-year mortality for both white and African-American patients who attended NCI centers. The authors said that their study “provides evidence that when African-American and Caucasian cancer patients attend similar types of specialized cancer care settings, all-cause mortality and cancer-specific mortality are similar,” while noting that several other factors likely play a role in cancer disparities. While receipt of care at non-NCI-designated cancer centers may help explain the increased cancer death rate of African-Americans, it doesn’t explain the maldistribution of NCI-designated cancer centers. How is it that NCI-designated cancer centers are more accessible to whites than to African Americans? Could it be that such centers are further away from African-American communities? In an earlier study conducted by this same research team, they found that Native Americans, nonurban dwellers, and people who live in the South had the longest travel times to the nearest NCI-designated cancer center. African Americans are primarily urban dwellers, segregated into inner-city ghettoes. However, a sizeable number of African Americans live in rural areas, and, according to the 2000 U.S., more than half of African Americans live in the South. Unequal access to cancer care and other health care services in the South reflects social inequities in this country. The South has a higher proportion of African Americans, people with less than a high school education, and people in the lowest income brackets. Geographic variation in health care service delivery is linked, in part, to the residential segregation by race and social class. Unfortunately, even for urban-dwelling African Americans, geographic proximity to a NCI-designated cancer center does not mean equal access to care. Minorities, for example, are under-represented in cancer clinical trials conducted at such centers. These trials often provide cutting-edge cancer treatments. Practice variation, lack of insurance, and implicit racial bias are some of the barriers to access in this setting. I think health care services need to be accessible, affordable, and approachable to all. Clinical services should be brought to where people live — right down to the community level. These services should be affordable, which, in my mind, means free. Health care is a right, not a privilege! Finally, the health care system must be culturally proficient, delivering culturally competent, high-quality care in an atmosphere that is welcoming and comfortable to minorities and other populations who currently are denied equal access to care.